Talking about speed, probably all of us will agree that the Bugatti Chiron 2017 still comes on top. Of course, some may argue that Hennessey Venom GT has higher top speed (270 mph) than Bugatti Chiron (261 mph). However, the Venom GT can only exceed that speed in one direction, whereas the requirement is 2 directions back and forth. Can Chiron even exceed the top speed of 270? It’s possible. But in any cases, no doubt that it is the fastest car in the world during its first release. And of course, we cannot just forget about it. So with no further ado, let’s take a look at the Speed Emperor – Bugatti Chiron 2017! Bugatti Automobiles S.A.S. is always a fearsome competitor in sports cars – supercars market. With the creation of Bugatti Veyron, Bugatti totally rocked the entire sports cars community with its outstanding performance. Back to the day, it was given the title Car of the Decade and best car award (2000–2009) by Top Gear. Also its Super Sport model also gained the reputation as the world’s fastest street-legal car by Guinness World Records. For quick answer, yes! 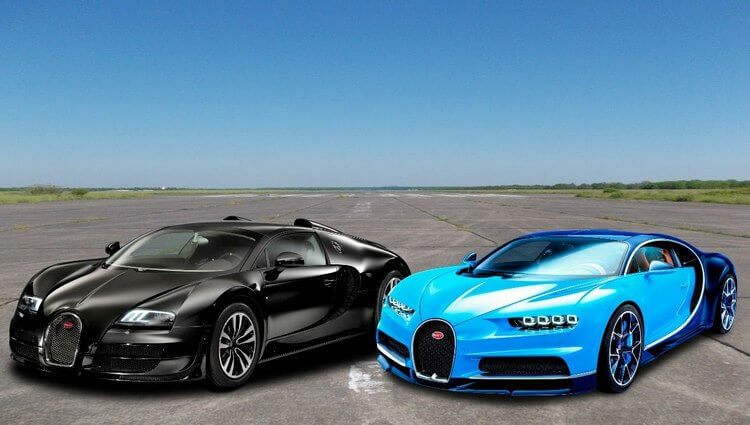 Bugatti Chiron surpasses Bugatti Veyron especially when it comes to speed. In 2017 IAA, Bugatti Chiron was announced to break the fastest 0–248.5–0 mph record within 41.96 seconds and in span of 2 miles. 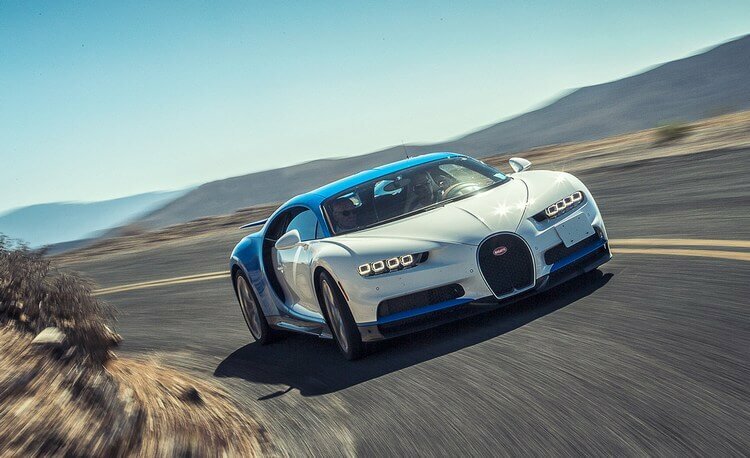 Also, its acceleration power is also much more powerful than the Veyron (2.4 seconds from 0 to 62 mph), making Bugatti Chiron a worthy successor of the Veyron in terms of speed. That said; how can Chiron surpass Bugatti Veyron aside from speed? Let’s find out! When a new car can break the fastest speed record, it means that its speed and power are definitely something. When it comes to Bugatti Chiron, we know that this “centaur” is absolutely terrifying, absolutely powerful. Of course as a hypercar, Bugatti Chiron’s power is definitely not something we can underestimate. For the engine, Bugatti Automotive seemed to decide going wild this time. Instead of V8, V10, or V12 engine, Bugatti Chiron utilizes the power of double V8, or to be more precise, 8.0-litre quad-turbocharged W-16 engine. As the results, Chiron the centaur gains the insane power of 1500 horsepower and 1180 lb-ft of torque. Based on the statistics, Bugatti Chiron can reach the max speed of 261 mph which is already an insane number by itself. That said, Chiron is expected to be able to even surpass 270 mph. But for road safety reason, we still don’t know for sure about its true power extent. Overall, this already gave us a good idea about how overwhelming Bugatti Chiron can be. And if we consider the speed aspect, the Chiron surpasses the Veyron in all factors: horsepower, top speed, and acceleration. For steering, Bugatti Chiron utilizes the power of electric steering, 4-wheel driving system, providing excellent comfort and accurate control for drivers. It is so excellent that considering Chiron’s electric steering among the best is never an exaggeration. But again, what overwhelming about Chiron is its power, and that’s what makes Chiron so wild. Riding a Chiron may feel intimidating at first. But once we get used to it, all the hesitation, fear, and intimidation will go away. Instead, all we can sense left is a pure wild ride: no worry, no fear, no problem! On the other hand, this wild sensation also makes us forget how calm the Chiron is. Driving inside the Chiron feels really comfortable and quiet. The noise is a big improvement since the Veyron. It may not feel impressive initially but once we get to 3-digit speed, speaking in normal tone will not be an option. EB Mode: the standard driving mode. Handling Mode: this mode provides more suspension, steering weight, and self-centering, which of course gives drivers more control over handling. To some extent, this mode provides the best driving feel. Lift Mode: this mode makes slight changes to Bugatti Chiron so that it can easily be loaded on truck or airplane. Autobahn Mode: this mode aims at enhancing the aerodynamic at high speed and giving more self-center weight for steering. It also auto-activated when reaching 112 mph. Top Speed Mode: this mode can only be activated with a separate Speed Key. Activating this mode means activating the true speed force of the Chiron. It will feel like activating a missile when we decide to use that Speed Key. If we have to describe Chiron’s interior, there are two words for it: elegant, and luxurious. The interior of the Chiron is a state-of-the-art work of leather, carbonfiber, and aluminum. It includes two 2 user-interfaces on the two side of the speed-o-meter which shows us pretty everything we want to know from water temperature, oil pressure, audio settings to tire pressures, and sat nav information. On the other hand, Bugatti Chiron only has 2 seats, yet they are pretty spacious and comfortable. The interior also utilizes sound-proof material (still, it is not enough when the Chiron truly goes wild). And talking about luxurious, Chiron actually includes a one-carat diamond membrane in the speakers. As a member of Volkswagen Group, Bugatti Chiron also has the similar design, but with some tweaks to transform it into a true hypercar. Here we won’t judge the appearance design of the Chiron since this is mostly subjective. Still, all we can say is that Chiron definitely has a solid design and it looks really awesome at that. About the body design, unlike the Veyron, Bugatti Chiron doesn’t have steel rear and instead, its body is a full carbonfiber work. This body work also has a few tweaks to increase its twisting and bending resistance. Aerodynamic and cooling systems are also another concern Bugatti kept in mind when designing the Chiron. According to their statistics, the 1,500-horsepower engine can generate over 3,000 horsepower of heat rejection via the heat exchangers. And thanks to the ducts which help routing the air out and around the Chiron, thus make it maintain cool condition despite the heat exchangers. In addition, the aerodynamic system is backed up with 2 parts: First, the underbody flapping forward of the front wheels which can modify the pitch and the speed to enhance the downforce. And second, during Top Speed mode or during the 49-degree air-brake position, the large wing at the back will rise and obscure the rearward vision and it’s pitched up 3 degrees. Both these two enhance the aerodynamic further and support the car’s cooling. Overall, Bugatti Chiron is truly an one-of-a-kind work with insane amount of details and more importantly, its raging speed. Its speed feels excellent, its handling feels excellent. 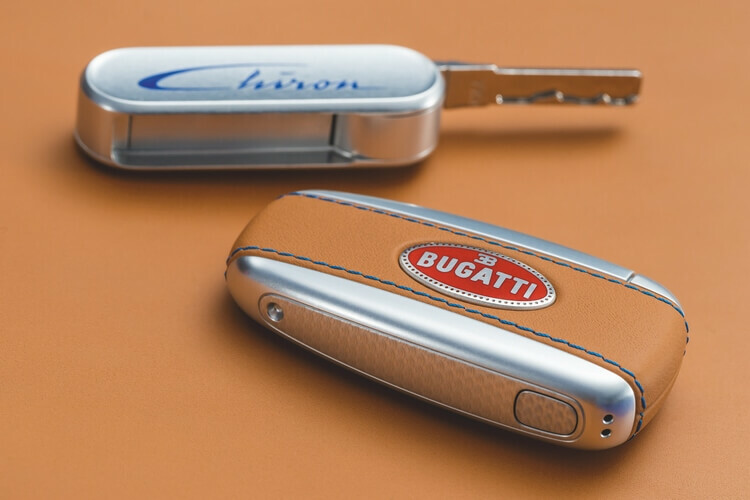 After all, who can say “no” if they have opportunity to try out the Chiron? Unfortunately, there is no much chance for us to experience the true power of Bugatti Chiron. Many car enthusiasts highly praise the Chiron, yet some say it is not really practical. 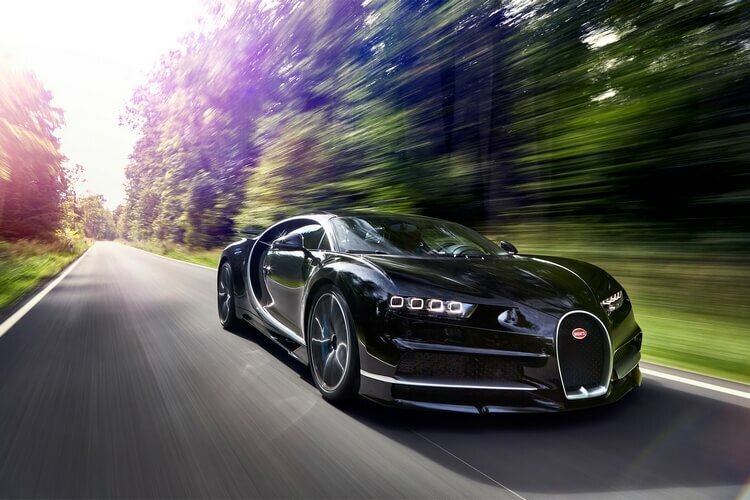 Even so, Chiron is still an worthy King of Speed, and it is the definitely worthy to success where Veyron couldn’t. And that’s it folk! 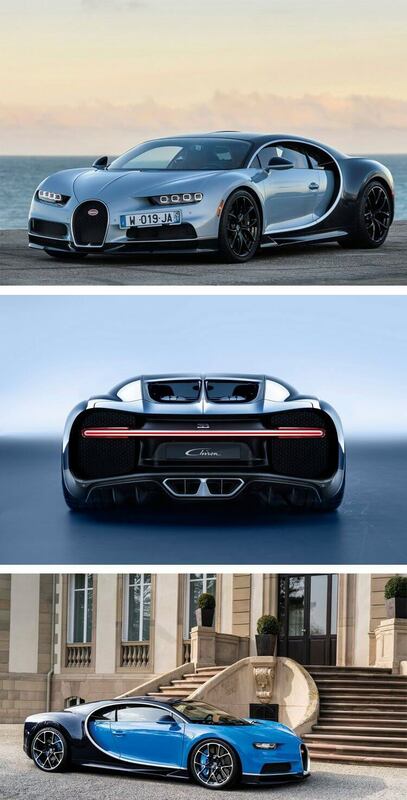 What do you think about the Bugatti Chiron? Feel free to share with us and for now, thank you and stay tune for more news in the future!